On one of our quieter days in England with everyone still recovering from the lurgy, I decided to take the boys out on a photo scavenger hunt around the village to see how many different house names and streets we could capture. 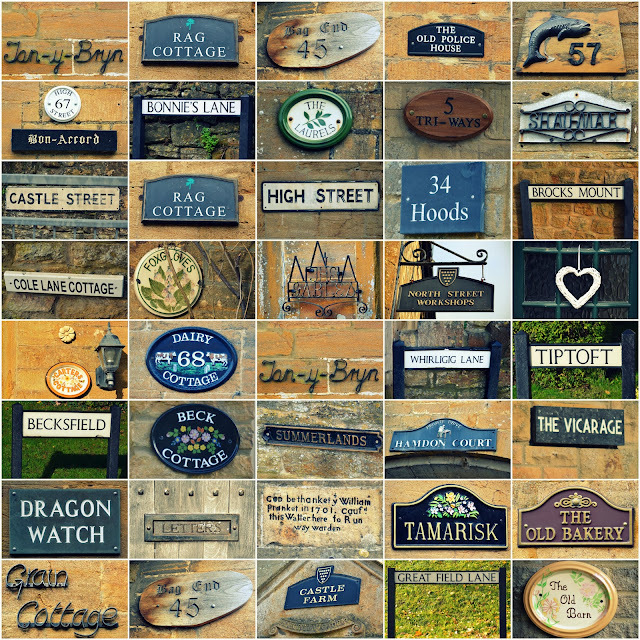 There are many unusual house names - some obviously hark back to an older heritage - like The Old Police House, or The Old Bakery. Others take their inspiration from their surroundings, and still others - well it's a mystery but fun to capture nonetheless. It was a fun filled half an hour of spotting and snapping until the camera battery ran out. The boys got very quick at finding the next photo opportunity - although Mylo bless him was even game for taking photos of alarm boxes on the side of houses such was his excitement at capturing anything with letters on it at all! We ended our little tiki tour of the village with a play in the park in relatively warm sunshine which was a joy as sunny warm days were definitely on the wane in the latter part of our stay. This idea was inspired both by hubby suggesting we should capture some of the unusual names from around the village and Miriam's recent BMWB post of her photo scavenger hunt.